9 years of strong experience in software development, test automation, test framework design along with building tools for optimizing testing in IBM & Oracle. I have worked on many time-critical projects and turned many project statuses from Red to Green by inventing new time-saving test approaches and tools consistently because of which I have received Top Contributor rating continuously all 5 years in IBM. Joined Oracle in ATG Product development team, learned many inner workings of it within no time, and quickly started developing critical functionalities. Fixed many long standing product bugs of complex nature. Also contributing to various open source projects in Java Community through Java User Group's Hyderabad Wing. Assistant Organizer of Java User Group Hyderabad and consistent contributor of Open Source projects like JBOSS Forge. In this tutorial, I will be demonstrating a simple example of how to use ServletContextListener to make some global initializations and configurations. We will be using WildFly application server and Eclipse to demonstrate the examples in this post. None database is required to run this example. A servlet context listener can be created using several approaches. We first have to implement ServletContextListener interface. Once created, we have to register this class as a listener. There are three ways to do that. First approach and the simplest is to use WebListener annotation. Another approach is to declare this class in web.xml or we can also use ServletContext’s addListener method. In this example, we will be taking the first approach. Let us first create a new Dynamic Web Project. Right click in Project Explorer of eclipse and choose New -> Dynamic Web Project. This will bring up a new project wizard. 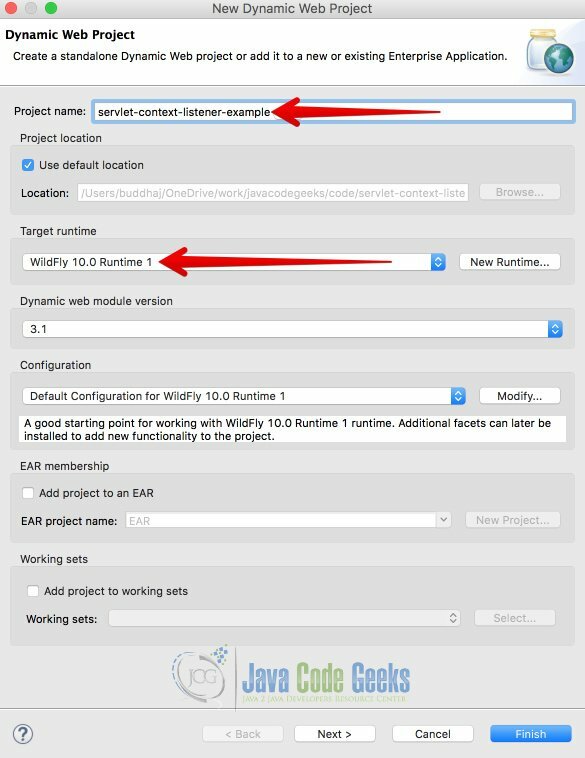 Give the project name and choose the target run time to be your application server’s runtime. Create this class in any package of your choice in a new Dynamic Web Project. Above class simply prints Server started and Server stopped when application server starts and stops respectively.You can create as many listeners as you wanted however each of them will be executed only once during startup and once during shutdown. 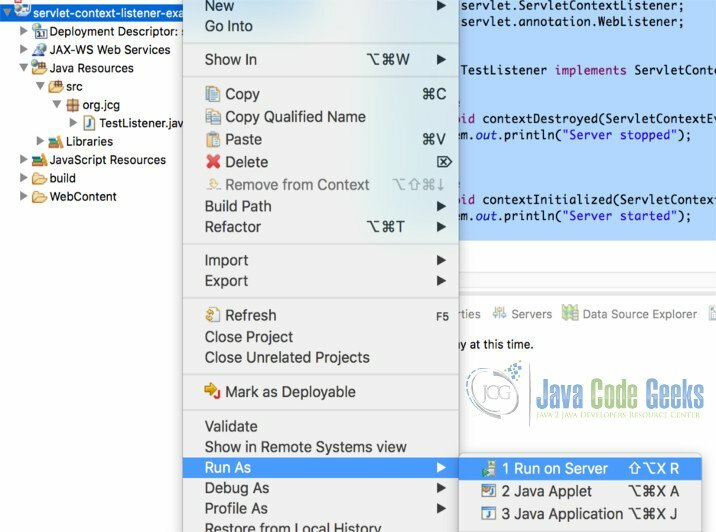 Once application server receives a startup request, it will look for any classes registered as servlet context listeners. Once identified, contextInitialized method of every class is executed and app-server will complete it’s startup process. Once started, application server will not be interacting with these listeners anymore. However when shutdown signal is received, app-server will call context destroyed methods of all the listeners before shutdown is completed. Right click on the project and choose Run As -> Run on Server. As shown in the below screenshot. Choose Your application server in the , in this example I’m using WildFly Application Server. I should see log like this. Observe line 2 to see the message we printed before application server startup is complete. Now, inorder to observe the server stopped message from contextDestroyed method, we need to stop the application server. To stop the application server cleanly, go to the bin folder of WildFly installation folder, and run the following command. Keep in mind that you won’t see the Server stopped message if you forcibly end the server process in eclipse by clicking stop button. It will only be executed when the application server stops cleanly. Which is why we executed the jboss-cli shell script.